Are you absolutely head over heels in love with your other half, so much so that the two of you want nothing better than to spend time with one another all day long, and even hug one another when you sleep regardless of how hot and stuffy it can get after a while? If you have answered in the affirmative to all of the above questions, then you would most probably want to check out the $3.99 Lovers Golf Tee. 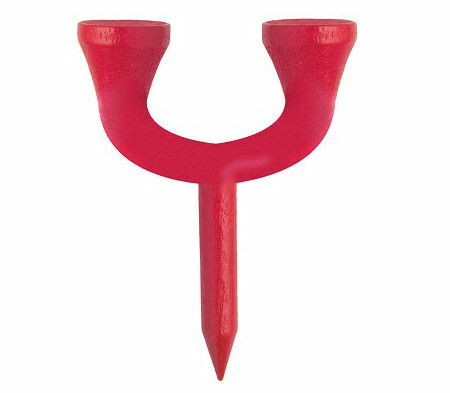 This is one golf tee which would enable two folks to putt simultaneously. Of course, it would make no sense at all on an actual golf course to do so. I mean, I myself am not a golfer, but I am pretty sure no one on the green putts simultaneously with someone else, especially when the balls are so close to one another. Well, I guess this would mean it is good only for a laugh, and nothing else, for that avid golfer of an other half in your life.